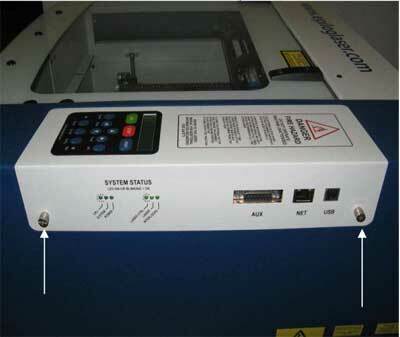 How do I replace the control/display on my Epilog Zing Laser? The control and display units are a single piece. They will be removed and replaced together. Included in the package that you received was an Anti-Static Strap. Wear the Anti-Static strap according to the instructions on the package. Always wear the Anti-Static strap when handling the control board. Static electricity can damage the control board. If the machine will still boot, before you remove the board please proceed through step 4. This will save you a lot of set up time when the new board is installed. If the board will not boot up, skip to step 5. The controller board that you have been sent has been programmed with the settings that were used to set your machine up originally. If the machine will still boot up, before you remove the controller board, please record the following information from the Function and Configuration menus of the machine. 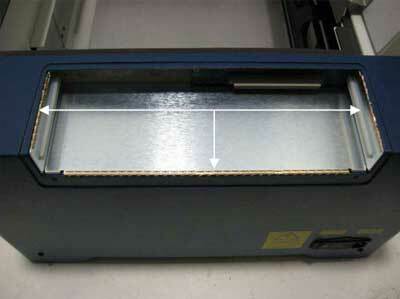 To access the function menu in the engraver depress both the “GO” and the “Pointer” buttons on the display. To cycle through the headings press the “Go” button. From the Configuration menu you will need to record the following information. To cycle through the Configuration menu, press the right directional arrow. Turn off the engraver and disconnect from its power source. The control assembly is on the right hand side of the machine as you face the machine from the front. On the right hand side of the control unit there are two captured screws. By captured, we mean that when the screws are loosened, they will stay with the control unit. Loosen the two captured screws shown in picture 1. Locate the anti-static strap that was included in the shipment and wear it according to the instruction printed on the side of the package before continuing. Grasp the screw heads and pull the control unit toward you. This may require a small amount of effort. You are disconnecting electrical connections when you remove the control board as shown in picture 2. Note around the outside of the control housing (picture 3) on the machines chassis, there are small copper strips with fingers that stick up. These are to shield the control board from electrical interference. Make sure that these copper strips stay in place when you remove the board and when installing the board. On the inside of the control housing there are two small grooves that the control board will fit in to shown in picture 4. Ensure that the tabs on the control fit in to these grooves before pushing the control board in to place as shown in picture 5a and 5b. 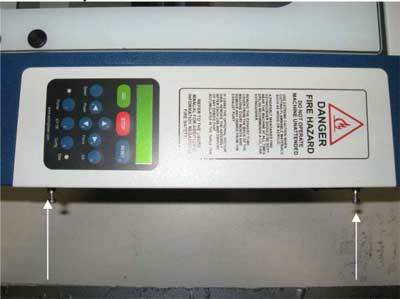 Slide the control toward the machine and tighten the captured screws to secure the control board in place. Reconnect the machine to its power source. If you were able to log the function and configuration information from the machine enter this information now.